“Sierra is doing great after her surgeries. She had a badly damaged right eye removed as well as being spayed. 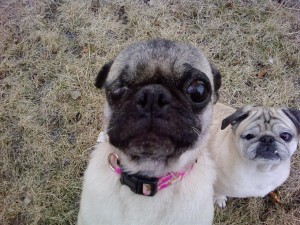 Sierra is 6-7 years old and was a stray when her guardian angels got her into the hands of pug partners. She is still a bit underweight but is steadily gaining and looking much better. Unfortunately her remaining eye has limited vision as well but Sierra is adjusting well with this minor problem. Her foster mom thinks her lack of vision is what contributes to her also being scared of many noises as she has to be close to something to figure out what it is. She gets along well with her foster sisters, two pugs and a lab as well as the cats in the house. We are still working on some house manners when left alone or separated from her foster mom so Sierra is in a crate during the day if no one is home. When everyone is home she likes to be right up on the couch next to one of her foster pug sisters. During the night she gets to sleep in bed with one of the sons and she likes to cuddle in close. Sierra continues to adjust well and is putting on weight. She is still very nervous. I took her out for awhile with Puggy on the leash and she did fairly well. Very limited vision is what I would have to report in her remaining eye. She does well in the house for the most part knowing where everything is. She has even mastered our stairs as long as she can go very slowly. Outside is more confusing. She runs into me, the other pugs, the fence or whatever else might be there. I let her run free in my yard with Mitzy and Puggy. If it looks like she is getting to close to the fence I can usually call her name and she stops.